How Big is Baby: The baby is the size of a waterfreakinmelon! Symptoms: I'm just so tired. You really do come full circle at the end! I'm heading up to bed by 9pm each night and it's like I'm reliving March/April/May again. At my doctors appointment I found out that my blood pressure has skyrocketed, so that's something we need to keep an eye on (in the meantime I'm freaking out). Luckily, I do not have protein in my urine, so it is likely gestational hypertension which is not too uncommon at the end. My doctor will have more information about what we'll do next at my next appointment. Sleep: I can still sleep! Apparently, I'm one of the lucky ones. I Can't Live Without: Sleeping, relaxing and putting my feet up. I Miss: Getting up from the fluffy couch without assistance. I am Looking Forward to: 37 weeks and full term status! 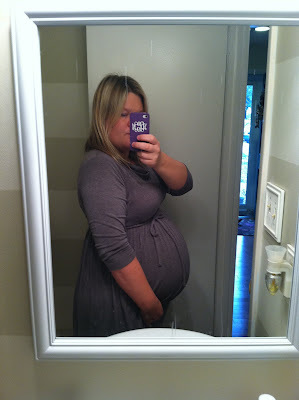 Milestones: I've survived 9 months of pregnancy with relatively few complaints. Diet: Eh, I'm in the last few weeks and I just don't care anymore! Movement: I'm definitely doing kick counts daily now because he has no room to move. Thankfully, he makes it every time, but sometimes I need to prod him along by putting a glass of ice on his back. Labor Signs- The cramping and contractions stopped and the baby appears to be quite happy inside. You're SO close! I can't believe how fast this went! You look so fabulous! All baby! Grayson will be here so soon ... it's insane! I can't believe you can sleep. I was so miserable in the end. The only position I was comfortable in was, well, NONE!